The measure needed 60 votes to advance, but was blocked when all Senate Republicans and four Senate Democrats opposed it. The rest of the chamber's Democrats voted "present." All 53 Republicans oppose the Green New Deal. Most Democrats decided on a strategy to vote present led by Minority Leader Chuck Schumer, D-N.Y. "I'm for it, but I have no problem voting 'present,' " said Murphy. 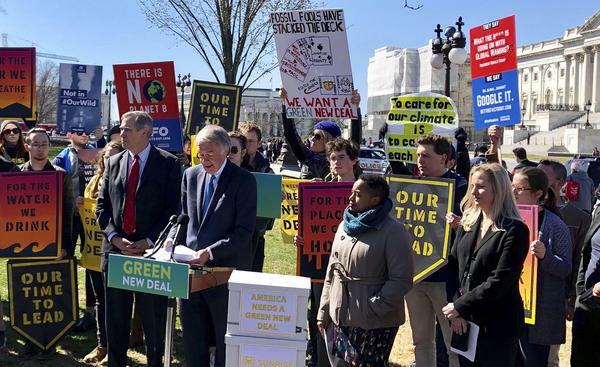 Schumer wants Democrats to run more aggressively in favor of climate change policies going in to 2020, although he conceded in an interview with The New York Times earlier this month that the exact legislative form that will take is still up for debate. "It's going to take us a little while to come up with a consensus that works," he said.